The corrosion behavior of Inconel 625 alloy at 800 and 900 °C in the molten salt of 75 wt% Na2SO4–25 wt% K2SO4 was studied. The corrosion mechanism of Inconel 625 alloy after hot corrosion is mainly alkaline melting mechanism. The Cr2O3 on the surface of the alloy dissolved in molten salt as Na2CrO4, leading to the loss of the protective oxide layer on the alloy surface. With the decomposition of Cr2O3 on the surface of the alloy, Cr-depleted region appeared at the interface of the alloy matrix/corrosion layer, which inhibited the growth of the Cr2O3 oxide layer and resulted in the discontinuous oxide layer. This caused O and S to invade the substrate and corrode the alloy matrix. When the alloy was corroded at 800 °C for 120 h, the corrosion rate was about 3 mg/cm2. The corrosion layer was relatively complete, and it mainly consisted of flaky Cr2O3 and spinel-like NiCr2O4. When the alloy was corroded at 900 °C for 120 h, the corrosion rate was about 6 mg/cm2, and obvious shedding and faults appeared in the corrosion layer, which were mainly divided into three layers: the outer layer was composed of NiCr2O4 and NiO; the middle layer was a dense Cr2O3; the inner layer was composed of sulfides (Cr2S3 and Ni3S2), oxides (Cr2O3 and NiO), telluride, etc. 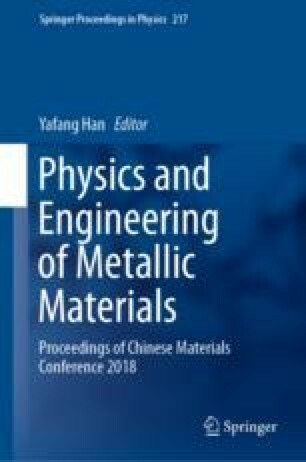 Through thermodynamic calculation and analysis, it was found that SO2 decomposed from molten salt under high temperature could cause severe corrosion to the alloy. The main corrosion products were Cr2O3, Cr2S3, NiO, and Ni3S2. The financial support by the National Natural Science Fund (51661019), Gansu Province Major Science and Technology Special Project (145RTSA004), National Key Laboratory of Nickel and Cobalt Resource Comprehensive Utilization (301170503).